Western Blotting: Secondary Antibodies - Advansta Inc.
Western blotting is an extremely sensitive method. The sensitivity and success of the technique is directly dependent on the antibodies that are used for detecting the protein of interest. Primary antibodies directly bind to the protein of interest, but unless they are directly conjugated to a dye or an enzyme, a secondary antibody is needed for detection. 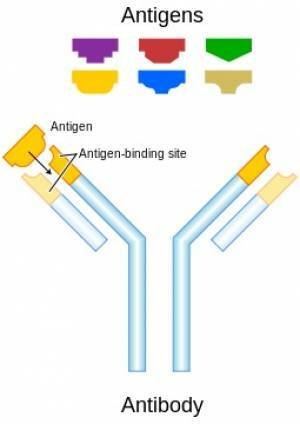 Conjugated secondary antibodies are used to detect the primary antibody. Secondary antibodies are commercially available in a variety of forms, including monoclonal, polyclonal, F(ab’)2 fragments, affinity purified, and preadsorbed. Several factors influence the choice of secondary antibody including the species specificity of the primary antibody, the class of the primary antibody, the detection method and any special factors regarding the technique or sample that would require a higher specificity secondary antibody. The following guide explains the factors to be taken into consideration when choosing a secondary antibody. The first factor to be taken into consideration when choosing a secondary antibody is the species of animal in which the primary antibody was generated. The secondary antibody must be specific for the species of primary antibody. If the primary antibody is a monoclonal antibody, then an anti-mouse secondary needs to be used. Similarly, if the primary antibody is a polyclonal antibody made in chickens, then an anti-chicken secondary antibody must be used. Therefore, secondary antibodies are usually offered with a variety of species specificities. Antibody molecules are large proteins (~150kDa) composed of four polypeptides. Two homologous heavy chains (~50kDa each) and two homologous lights chains (~25kDa each) join together to form a Y-shaped molecule (see Figure 1). When assembled together, the “tips” of the Y (each composed of a heavy and light chain) form antigen recognition domains (shown in yellow). The antigen recognition domain is called the fragment-antigen binding, or Fab fragment. The Fab fragment is highly variable and accounts for the specificity of the antibody for a particular antigen. Due to the composition of the antibody molecule, each antibody can recognize two identical antigens. The antibody molecule also contains a non-variable region called the conserved region, or Fc fragment. Secondary antibodies can be purchased that recognize only specific regions of the primary antibody. Antibodies are classified into different classes (also called isotypes). Placental mammals express 5 different classes of antibody named by the type of heavy chain: IgG contains gamma chains, IgM contains mu chains, IgA contains alpha chains, IgE contains epsilon chains and IgD contains delta chains. Each heavy chain can associate with 1 of 2 light chains called kappa and lambda. Antibodies are further classified into subclasses based on minor differences in the heavy chain of each class. Secondary antibodies can be used that recognize the different classes and subclasses of primary antibodies, depending on the requirements of the target sample and assay. The secondary antibody must be specific for the class of the primary antibody. Polyclonal primary antibodies are usually raised in rabbit, goat, donkey or sheep and are the IgG istotype, containing a mixture of the different subclasses. The secondary used will be a general anti-IgG antibody that will recognize heavy and light chains of all subclasses. This antibody may also interact with other istoypes through recognition of the light chain. Monoclonal primary antibodies are usually raised in mouse, rabbit or rat. Since monoclonal antibodies are clonal, each antibody molecule will be of the same subclass (for example IgG1, IgG2a, IgG2b, IgG2c, IgG3 in the mouse). While a general anti-IgG secondary antibody can be used that will recognize all subclasses, sometimes it can be advantageous to purchase a sub-class specific antibody (e.g. anti-mouse IgG2a) to increase the specificity of the interaction or when detecting multiple primary antibodies of different classes simultaneously. Note: Birds produce a novel immunoglobulin protein called IgY and anti-IgY secondary antibodies must be used when working with primary antibodies generated in chickens. Secondary antibodies can be used that recognize specific parts of the primary antibody. An anti-heavy and light chain (H+L) secondary antibody recognizes both the heavy and light chains of the antibody molecule. This is a commonly used secondary antibody particularly when the class of the primary antibody is unknown, since all immunoglobulin classes share the same light chains. Secondary antibodies that only recognize light chains can also be used. These antibodies can be very helpful when performing immunoprecipitations followed by Western blotting. Use of the anti-light chain antibody will prevent recognition of the 50kDa heavy chain protein on the blot. However, the 25kDa light chain protein will still be visible. The secondary antibody can be modified to decrease background and/or increase sensitivity. Certain cells (e.g. many cells of the immune system) or tissues (e.g. spleen) contain Fc-binding receptors, cell surface proteins that recognize and bind to the nonvariable Fc portion of antibodies. If the target sample contains Fc receptors, then the secondary antibody will be bound to the sample via the Fc portion of the antibody and specificity will be lost. To overcome this problem, the Fc portion of the secondary antibody can be enzymatically cleaved off leaving only the variable portion of the antibody. Use of these antibodies, called F(ab’)2, ensures that the secondary antibody is only binding to the primary antibody through its antigen recognition site. Due to their smaller size, F(ab’)2 fragments also diffuse easier into tissues and may gain better access to antigens. Secondary antibodies can undergo additional purification steps to increase the specificity of the antibody. 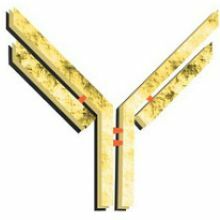 Polyclonal antibodies can be affinity purified to increase sensitivity and decrease background. Undesired antibodies are removed by purifying the antibodies through a column. For example, anti-rabbit IgG antibodies can be purified through a column containing rabbit IgM and IgA. Anti-IgM and anti-IgA antibodies will remain bound to the column while anti-IgG antibodies will flow through. Affinity purified secondary antibodies have the benefit of containing very high affinity antibodies and therefore may be useful in detecting low abundance proteins. Secondary antibodies can also be purified by adsorbing the antibodies against IgG molecules from other species of animals. Adsorption removes potential nonspecific interactions among related species. It can also be used to reduce shared reactivity among heavy and light chains. For example, an anti-mouse secondary antibody might also recognize similar regions on rabbit IgG if rabbit IgG is used in the same assay. Adsorption of the anti-mouse antibody to rabbit IgG will remove this reactivity. Adsorbed antibodies are designed for particular applications, such as immunohistochemistry or multiplex assays. Care needs to be taken when using these antibodies though; adsorption can also titrate out the desired antibodies and lead to a decrease in sensitivity. Enzyme conjugated antibodies are versatile as a variety of substrates are available for detection and documentation. The two most frequently used enzymes are horseradish peroxidase (HRP) and alkaline phosphatase (AP). Incubation of the enzyme-conjugated secondary antibodies with appropriate substrates will produce color or light for detection of the intended protein. In general, HRP is more sensitive than AP, because the enzyme has a faster catalytic rate and produces more product in a shorter time. However, the product tends to fade quickly. In addition, the activity of HRP is limited due to an oxidation reaction. While AP has a slower catalytic rate, it is not limited and the reaction rate remains linear over a longer period of time. Sensitivity can be increased by allowing the reaction to continue for a longer period of time, however increased incubation times can lead to high background, decreasing the signal: noise ratio. The simplest substrates for use with enzymes are the color-producing chromogenic substrates. Chromogenic substrates are not as sensitive as other substrates, however color development occurs directly on the blot precluding the use of special development and documentation equipment. As the color can fade overtime, the membrane needs to be photographed or scanned for permanent documentation. Since the advent of enhanced chemiluminescence (ECL), many substrates have been developed for light production by HRP. ECL allows consistent and very sensitive detection that can be documented on X-ray film or through digital imaging equipment. Advansta sells a family of HRP products optimized for ECL with film or CCD detection, including WesternBright Quantum, which was specifically designed for quantitative ECL Westerns. Fluorescently-labeled secondary antibodies conjugated to fluorophores are easy to use for detection as no additional steps are required for substrate development. However, equipment with the appropriate excitation and emission capabilities is required for each individual fluorophore. Fluorescently-conjugated secondary antibodies are most frequently used in FACS experiments, in immunofluorescent detection of proteins in cells or tissues and more recently, in Western blot analysis using CCD detection. While the first fluorophores were limited to a few spectral wavelengths, newly developed fluorophores have increased the options to include dyes in the infrared and near infrared ranges. Fluorescently-labeled secondary antibodies are increasingly used in multiplex Western blot assays to detect multiple antigens simultaneously. Advansta offers a line of fluorescently-labeled secondary antibodies conjugated to traditional fluorophores in the visible range such as APC and PE, as wells as two infrared dyes (IR700 and IR800) for multiplex Westerns. Biotin-labeled secondary antibodies can be used to amplify the signal intensity and increase sensitivity in immunohistochemistry, Western blots and ELISAs. The technology takes advantage of the strong affinity of avidin for biotin. After incubation with the biotin-labeled secondary antibody, the target is incubated with avidin (a glycoprotein in egg white) or streptavidin (from the bacteria Streptomyces avidinii). The (strept)avidin can be conjugated to an enzyme or a fluorophore for immediate detection. Alternatively, the target can be further incubated with additional biotin molecules forming a molecular biotin-avidin-biotin “bridge” prior to detection. Since each (strept)avidin molecule binds four biotin molecules, the signal is amplified. The biotin-avidin system is compatible with all species of antibodies. AdvanFluor-Streptavidin for detection of biotinylated proteins can be purchased from Advansta in two, extremely bright fluorescent dyes. A more recent secondary antibody conjugation technology is polymers. Several companies market polymer-conjugated antibodies (usually a proprietary technology) and some also sell accompanying detection kits for use in ELISAs, Western blots and immunohistochemistry. Polymers of active enzymes (e.g. HRP) are conjugated directly to secondary antibodies in a manner that does not inhibit antibody function. Sensitivity is increased because the number of active enzymes per antibody molecule is increased. Using polymer-conjugated antibodies is similar to using biotin-conjugated enzymes for increased sensitivity, however only one incubation step is required with the polymer antibodies.